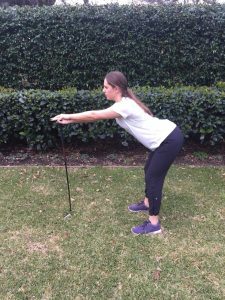 Can my Osteopath help lower my golf handicap? Can my Osteopath help lower my golf handicap? YES!!! 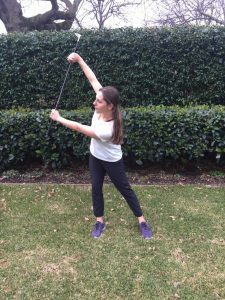 The golf swing is a highly complex movement pattern, which requires coordination of all the body’s joints and muscles along with timing and balance. Due to the length of the golf club, small variations in movement are amplified resulting in large changes in golf-head trajectory. For this reason, even small dysfunctions in movement patterns can have large disturbances in your golfing performance and therefore this is how your osteopath can help you lower your golf handicap. When examining a golfer we look at all phases of the golf swing and how limitations in your movement effect the kinetic chain of your swing (IE: how the energy produced by in your legs is able to transfer effectively into the core and arms). Osteopathic treatment and exercise advice for golfers aims at optimising performance, preventing injury and helping to recovery from existing injury. 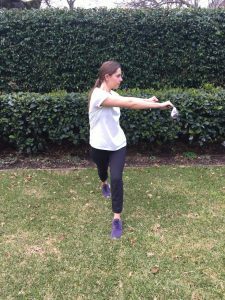 Below are some warm-up exercises that can aid in a smoother golf swing and can best prepare your body for the movements and stress it endures during your golf game. After a few holes and as your muscles are recruited to swing your golf club, lactic acid may be produced by your muscles. Cooling down appropriately is very important, as this lactic acid can build up and be the reason you become sore after a game. A cool down involving the exercises listed below can counteract the effects of lactic acid build-up and help prevent potential injuries. Trunk and hip rotation are essential in your back swing and follow through. This exercise encourages rotation of your back and both hips as you twist over your front leg. It should be done on both sides. Amount: 3 sets of 10 rotations to each side Tip: Keep your back straight. Note: Restriction in this area can lead to excessive stress and strain through the lower back and on the leading knee, making them more vulnerable to injury. 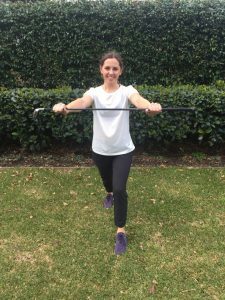 This exercise targets the shoulders, back and hips. 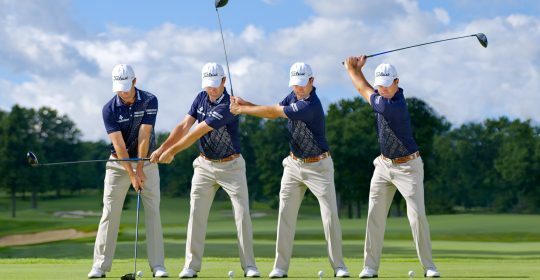 It’s aimed at replicating the movement required during your back swing and follow through. It’s important to drive your hips side to side and transfer your weight from each foot as you swing side to side. Amount: 20 swings back and forth Tip: Use your bottom hand to push the club up at the top of the swing. 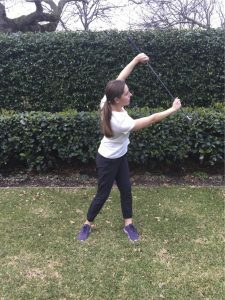 Note: Restriction through the shoulder and trunk can lead to excessive strain on the lower back and neck; this can shorten the length of your overall swing and reduce the efficiency of your swing. This stretch targets your lower back, gluteal (buttock muscles) and hamstrings, as well as increasing back flexion. As you bend forward, push your hands forward on the club and push your bottom back. You should feel a stretch through your lower back and hamstrings. Amount: Hold for 15-20 seconds and come back up, do this 3 times. Tip: Keep knees slightly bent and have your weight through your heels. Note: Please take care in doing this exercise, especially if you have had a previous injury to your lower back. One of the main osteopathic principles is structure governs function. Osteopaths will look at each individual and assess the whole kinetic chain involved in your swing, to optimise accuracy and speed. We do not look at one part of the body in isolation. Due to the golf swing being so complex and requiring coordination of all the body’s joints and muscles, Osteopaths can assist the body in eliminating these smaller dysfunctions to get the best out of your swing. Come in, get a check up and show your mates up on the golf course this weekend. New to Osteo Net ?